recipes with the ingredient red chilli sauce. Red chilli sauce refers to the slightly sweet and spicy, red colored sauce that is widely used all over the world. Even though the most common variants are used in Chinese or Indo-Chinese cuisine, it can actually be used in many preparations all over the world. The main ingredients of this sauce are dried chillies, tomatoes, vinegar and sugar. The sauce can be made in various degrees of spiciness and with different types of chillies. American Chop suey, which basically means a savory mess, is the first thing that comes to my mind with chilli sauce. A bed of crispy noodles topped with and sweet and spicy vegetable gravy is everyone's dream dish come true. Red Chilli Sauce forms an important part of Chinese food. Exotic foods like Crackling rice topped with Manchurian gravy are a delight to have. Here the chilli sauce is added to the gravy to give it that edge of spiciness. Who says you can't use chilli sauce to spice up Indian food. Spread some on a roti, paratha or thepla and make a wrap out of it. Methi Thepla Wrap is such an innovation with a potato bhaji stuffing and flavoring coming from the red chilli sauce. It can also be used as a spread on burgers! Even though it might seem odd to some, chilli sauce makes a great spread for a Cheese Stuffed Veggie Burger. The sauce is so versatile that it is also used for making diverse types of snacks from street food of Mumbai to Mexican starters. Red chilli sauce is a very important component for street food in India. My absolute favorite recipe with it is Schezwan Noodle Frankie. The tanginess and spice form the sauce, the crunchiness from the vegetables and slurpiness from the noodles make this the best. Tostadas are basically fried tacos that are served with a filling of refried beans, sour cream and topped with the fiery chilli sauce. Chilli sauce adds a zing to many simple starters like Cheesy onion and Chilli Toast. Add chilli sauce along with other sauces like mayo and mustard sauce on a Paneer Tikka Sub sandwich to make the most of a delicious, filling snack that will leave you wanting for more. When you think of Stuffed Cheesy Schezuan Pav, you think of gooey, cheesy goodness between bread and this is exactly that! Apart from the schezuan sauce, it is the chilli sauce that provides it a little kick that it needs. Another simple but elegant recipe is Moong Dal Waffles with stir fried vegetables. A savory and innovative twist to the classic waffles, this moong dal delicacy is served along with spicy stir fried veggies coated in chilli sauce which makes the whole dish. If you want to know more about the Uses of Red Chilli Sauce, then you can check out our article on that. 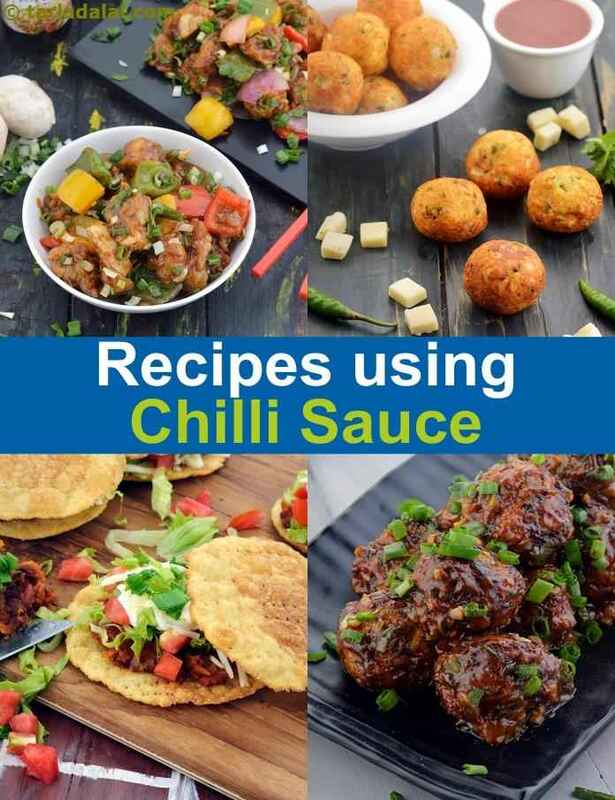 Hope you liked this collection of red chilli sauce recipes. Scroll down below for more. Another one-pot meal from oriental cuisine, hakka noodles is quite sumptuous as there are a lot of vegetables in it. Apart from what is mentioned in the recipe, you can add other grated veggies and even paneer to it. You can alter the amount of chilli sauce depending on your spice quotient.